As well as my Negative / Slide Scanner, I needed a means to scan in actual photographs that I don't have the negatives for. I've never been much of a fan of flatbeds, due to physical size, resolution and any number of things that can influence the results. I'm pleased to say they have much improved over the years and with a good editing package and time the imperfections can be corrected. I picked this scanner up in a sale at PC World for about £80 in 2002 and it works well for me. Setup is fairly painless for the ScanJet 4400c, which is compatible with Windows 95, 98, Me, 2000, and NT 4.0, plus Mac OS 8.5 to 9.1. Take your pick of parallel or USB ports (the scanner supports both) and you're up and running in a couple of minutes. HP includes a USB cable with the scanner, but parallel-port users must supply their own. The only included documentation, a quick-start guide, is downright skimpy, but HP's vast, online support library (which includes FAQs and a searchable or browsable troubleshooting section) will provide an answer should you run into any problems. The 4400c's 19-by-12-inch footprint doesn't leave a lot of room on your desk, and compared to sleek scanners such as the slim Canon CanoScan N670U, the ScanJet looks like a leviathan. However, part of that bulk is due to the scanner's two 48-bit CCD scanning heads--one 300dpi (dots per inch) head for fast, low-resolution images and one 1,200dpi head for the high-resolution fancy stuff. In CNET Labs' tests, the dual CCD heads delivered fairly swift performance. For example, a full-page colour scan, taking around 30 seconds on average, makes the ScanJet 4400c the second fastest of the cheap scanners we've tested. The 4400c's image quality was also pleasing to CNET's sceptical jurors. Image clarity and colour matching were top-notch, as the scanner picked up subtle lines and tones correctly. Scanning at lower resolutions, the ScanJet faltered a bit at colour saturation and contrast; while the colons looked true to life, the image looked somewhat pale overall. At higher resolutions, however, images were clear as a bell. Greyscale scans were not as good--shadows abruptly darkened or contained large patches of dark or light pixels. Along with strong image quality, the 4400c offers a cornucopia of features that make scanning quicker and easier. Buttons on the front of the unit send scans to your e-mail program or printer, automatically scan photos, and put the scanner in power-save mode. To assist with the ScanJet 4400c's long list of services is a big software bundle--but in this case, bigger doesn't mean better. Kicking off the list is HP's PrecisionScan 3.1 Pro, which handles most of the scanning duties. Its feature list is long and includes built-in OCR, image editing, detailed scanner settings, and exotic functions such as scan-to-Web and scan-to-CD (if you have a CD-R/RW drive). But PrecisionScan could definitely handle a usability touch-up; some tools are hidden behind miles of menu commands. 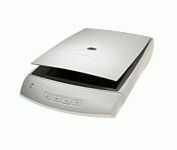 The ScanJet 4400c also comes with a bevy of programs for image editing, archiving, faxing, and building Web pages. HP's PhotoPrinting software is an image-editing and archiving tool, although its functions are somewhat limited.